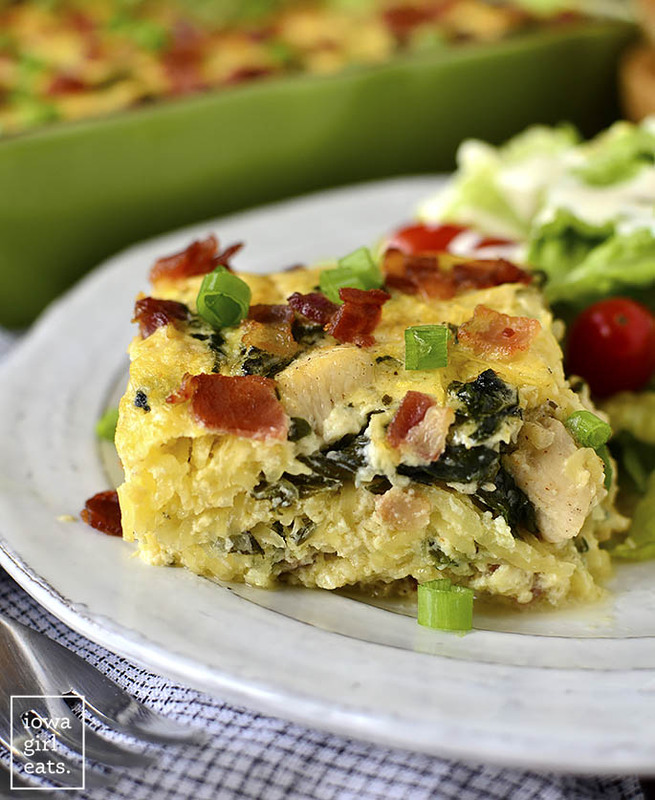 Chicken Bacon Ranch Spaghetti Squash Casserole is a flavorful fall casserole recipe. 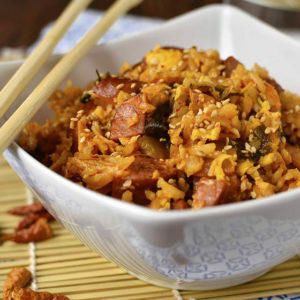 Even my squash-averse family loves this scrumptious, gluten-free dish! We all know that kids are famous for turning up their noses at healthy foods, but what about 60-something year old Dads? With a Figi snarl on his face and everything. Figi was my Mom’s dog growing up who lived so long she developed RSF aka resting snarl face. That dog was…something else. Anyway, I said, “Dad, come ON! It’s spaghetti squash not chicken wings (hates getting saucy hands) plus it’s got bacon and ranch in it. Also you are not 10 years old. Eat the dang squash.” So he did. And guess what? He LOVED it! My point? 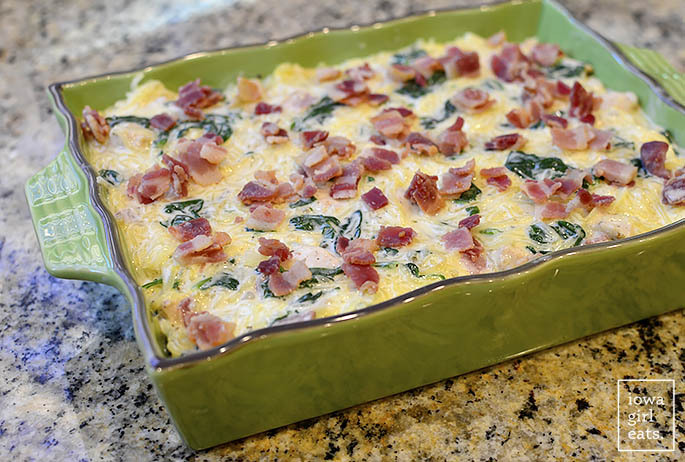 Even if you think you don’t like spaghetti squash, give this healthy yet decadent-tasting, fall-ready casserole a try! 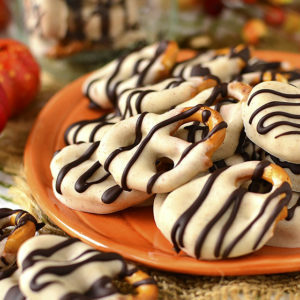 This recipe comes from the brilliant (and hilarious) mind of Juli from PaleOMG. The day after my parents babysat, my Mom emailed asking for the recipe and I’d made so many adjustments to fit our family that I decided to post the casserole with my adaptations. That said, the credit for this fun and delicious idea for enjoying spaghetti squash definitely goes to Juli! 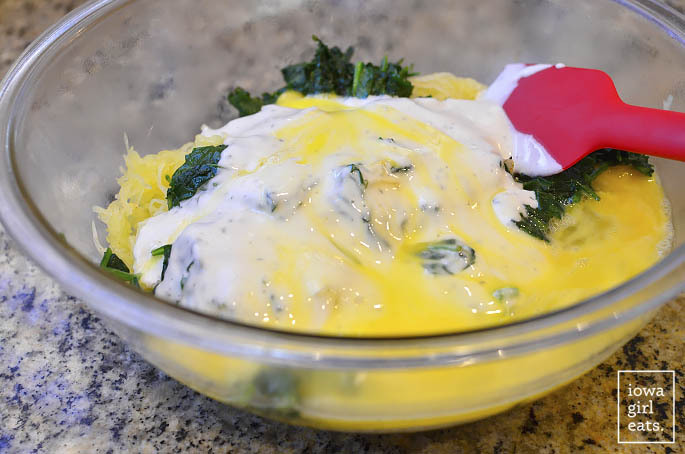 Spaghetti squash is roasted, shredded, then combined with chicken, bacon, sauteed spinach, eggs, and YES, ranch dressing (!) 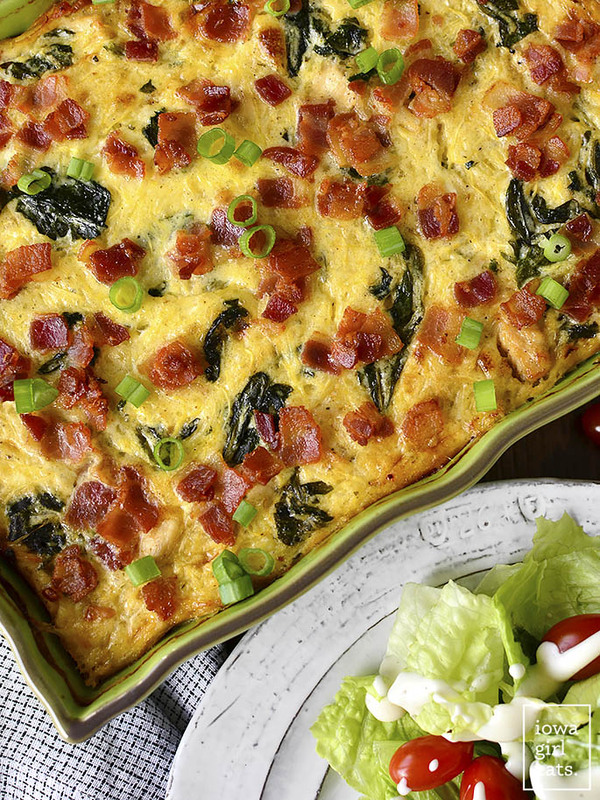 to create a super filling casserole that’s perfect for chilly fall nights. And it bears repeating that even my Dad, the squash hater, gave it two thumbs up. Start by roasting a spaghetti squash. To save some time, I recommend you do this a day or even a few days ahead of time. Slice 1 medium-sized spaghetti squash (about 2-1/2lbs) in half then scrape out the seeds and place cut-side-down on a silpat or foil-lined half sheet pan. Roast at 400 degrees for 30-40 minutes, or until the squash shreds when you run a fork down the center. Be careful not to over bake, otherwise the squash turns really mushy. Better to err on the side of al dente vs overdone as it will continue to bake inside the casserole. Once the squash has cooled slightly, shred the insides with a fork then add to a large bowl. 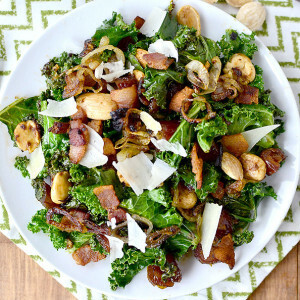 Meanwhile, add 6 slices chopped bacon to a large, 12″ skillet over medium heat then brown. 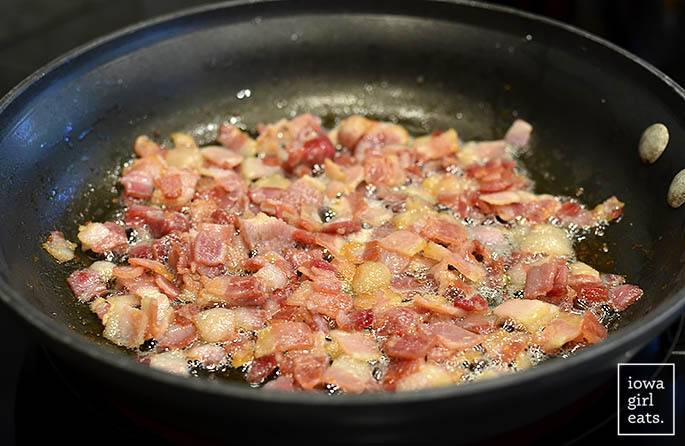 Scoop the bacon onto a plate then remove all but 2 Tablespoons bacon grease from the skillet. 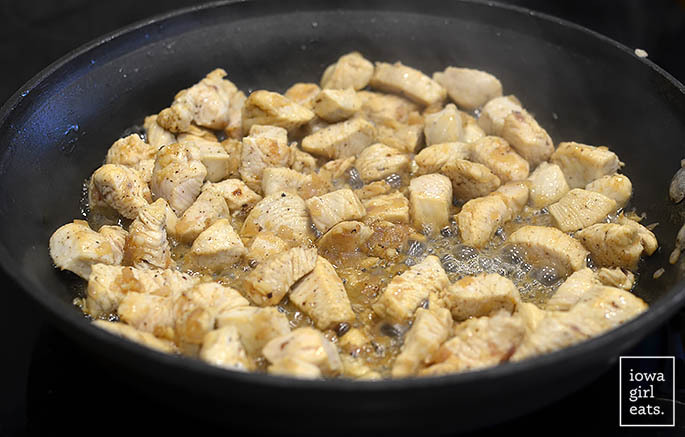 Turn the heat up to medium-high then add 2 chopped chicken breasts and 1 shallot or 1/2 onion. Season with homemade seasoned salt (or regular) and pepper then saute until cooked through. Add 2 cloves minced garlic and 5oz baby spinach that’s been roughly chopped (UNPICTURED!) then saute until the spinach has wilted, about 1 minute. 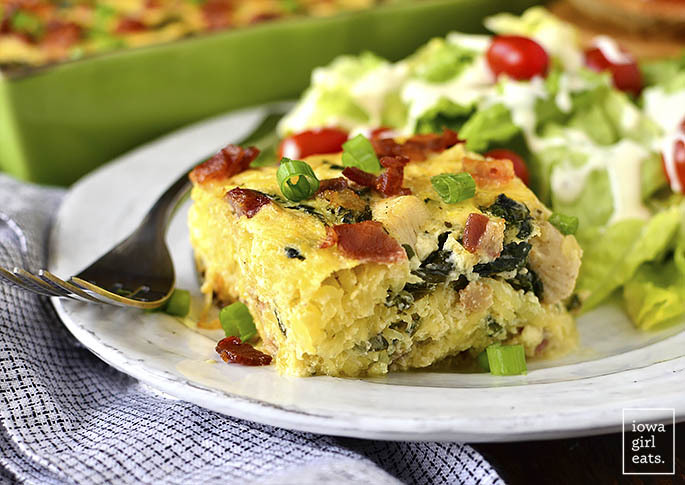 Add the chicken and spinach mixture to the bowl with the spaghetti squash, along with half the cooked bacon, a scant 1 cup ranch dressing, 3 whisked eggs, and more seasoned salt and pepper then stir to combine. I used Marzetti Simply Dressed Ranch Dressing and it was fantastic! I’m a die hard Tessamae’s Creamy Ranch fan, but it’s a bit too dill-flavored for my family’s liking. 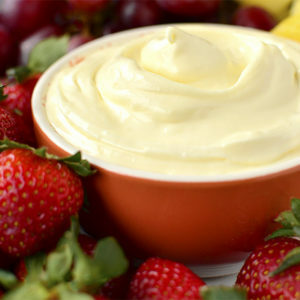 Marzetti’s tastes closer to a traditional ranch dressing and has a great ingredient list to boot. 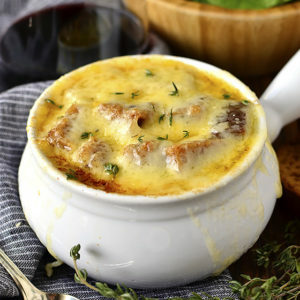 Pour the mixture into an 8×8″ baking dish (or similar sized baking dish) then top with the remaining bacon and bake at 350 degrees for 45 minutes to an hour, or until the center has set and the sides are browned. Let the casserole sit for 15 minutes or so before scooping out and plating. 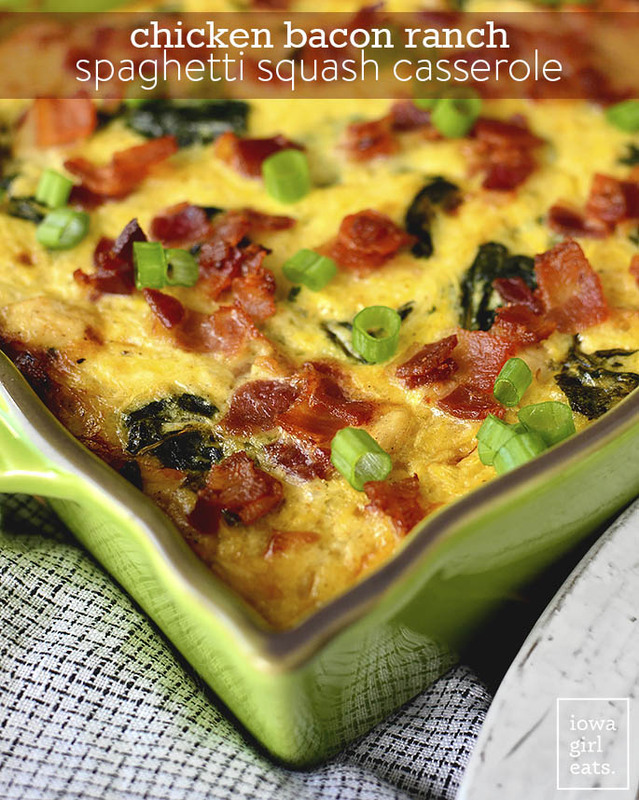 I hope you love this healthy, fall-ready casserole! Enjoy! Preheat oven to 400 degrees then line a half sheet pan with a silat or foil. 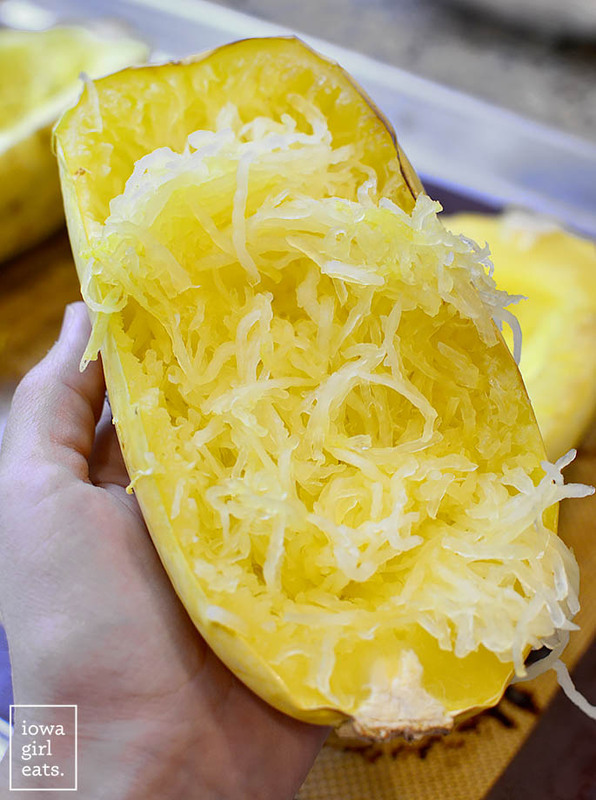 Slice spaghetti squash in half using a large, sharp knife then scrape out the seeds with a spoon and place cut side down on the prepared sheet pan. Roast for 30-40 minutes, or until the squash shreds relatively easily with a fork (don’t overcook or the squash will become mushy.) Set aside to cool then turn heat down to 350 degrees. Once spaghetti squash is cool enough to handle, shred squash with a fork then add to a large bowl. Can be done a day ahead of time. Meanwhile, add chopped bacon to a large, 12” skillet then place over medium heat. Saute until bacon has browned then transfer to a plate. Remove all but 2 Tablespoons bacon grease from skillet then turn heat up to medium-high. Add chicken and shallots or onion, season with seasoned salt and pepper, then saute until the chicken has cooked through. Add spinach and garlic then saute until spinach has wilted, 1 minute. Scrape mixture into the bowl with the spaghetti squash. Add ranch, eggs, and half the cooked bacon to the bowl, plus additional seasoned salt and pepper, then mix well to combine. Pour mixture into an 8x8” baking dish (or similar sized baking dish) then top with remaining bacon. Bake uncovered for 45-60 minutes or until the center has completely set and sides are golden brown. Let cool for 15 minutes before slicing and serving. I’m a bit squash-averse myself but can’t wait to try this one! Up to what point could you make ahead? Could I make The whole casserole and then just bake it within a day or two? I would like the answer to the above question too. Also would this be good for breakfast? Molly, VERY good for breakfast – the eggs almost give it an egg casserole taste! Kate, yep – you can roast the squash up to two days ahead of time then assemble the casserole up to 24 hours before baking. I hope you love it! This is the best way I’ve ever eaten spaghetti squash. Loved it! Ooo I’ll have to look for the spaghetti pie recipe – thanks for the tip! “Eat the dang squash, dad”. You just made my morning. Any tips on slicing spaghetti squash without slicing a finger off? Poke the squash around the center a few times with a knife then microwave for 1-1/2 minutes before slicing.. Another option is to slice off the stem end so you have a very sturdy base to use when slicing through vertically. Man, what is it with 60-somethings?!?!? I had a salad last time I was home that had kale in it and he asked if it was kelp. What?!?! My parents always tease us that we are the “healthy generation” but I can’t figure out why they think eating SpaghettiOs is ok at 65!!!! Gross!!! Hehehe – you got it – hopefully sometime you can try this recipe out with your dad too! Looks delicious and I can’t wait to try it! I love your casserole dish – makes such a pretty presentation. Hi Christy! I tend to think that the squash will become very mushy if frozen, unfortunately! My 60-something squash averse husband just went back for seconds. I may, or may not, eventually tell him WHAT he just ate! YES – success!!! Thanks for the great feedback, Chris! Hahaha, bacon DOES make everything better! ;) Thanks for the review, Maureen – I appreciate it! Hi! I’m new to squash and was wondering what to do with the roasted squash if I wait to make the casserole. Do I cover it and refrigerate it? Do I shred it and put it in a bowl in the fridge? Any help is appreciated, I love all your recipes and can’t wait to try this one! Great question, Sarah! Roast then shred when the squash is cool enough to handle, then you can just store the shreds in a pyrex or gladware container. Let me know if any other questions at all! This was delicious. I made it last night for my parents. My mom and I loved it. Very moist. I used a yogurt ranch from sprouts. Thank you! WOW! This was so delicious. I prepped it over the weekend, popped it in the oven last night and it was perfect. Thank you for sharing. I love all your recipes! Yah!!! So glad you loved it, Deirdre! Thanks for the great feedback! 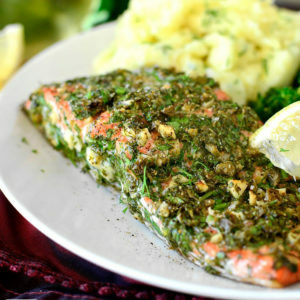 I made this recipe for my husband and I and it quickly went to the top of our favourites list. It was delicious! That is music to my ears, Elaine – thanks for your feedback! This was excellent. I used turkey bacon. However, the Hidden Valley Ranch, with bacon, more than made up for the bacon flavor. Thanks for the recipe! Yum – great idea, Michelle. Thanks for your review! Any suggestions for swapping out the ranch dressing for some other dressing, I really am not a fan of it? This is really good. My hubby was so distracted by the spaghetti squash , the spinach, which he hates cooked, went completely unnoticed. It was a big hit on this first day of 2018! I made this, substituting on hand ingredients, which for me meant acorn squash, and green peppers, onions and mushrooms instead of spinach….still super awesome! We really didn’t enjoy the spinach in this at all, despite loving spinach. It almost had a seaweed flavor that was very unpleasant. Will leave out next time. 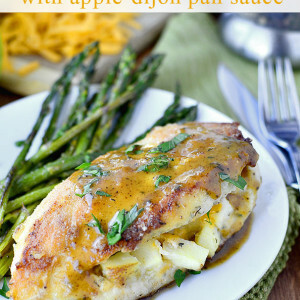 Making this tonight with spicy Chipotle ranch and I’m adding some cheddar cheese to the dish! Can’t wait to try it!! Can I reheat leftovers tomorrow?? Holy cow it was good. It was every bit as good as the comments said. Because I waited so long to prep and start cooking, my husband and I didn’t eat until after my 15 month old triplets went to bed. So today they had the leftovers and between the three of them ate probably two adult portions worth. I heard them “mmm” while eating so you know it’s good. 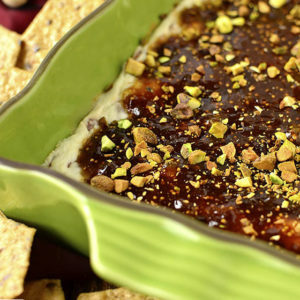 This is definitely going in our repeat recipe folder! Took a chance and made this as written for a family dinner today. HOLY SMOKES is it good!!! I didn’t expect the sons-in-law or my husband to like it due to the spaghetti squash and spinach but it was a hit with everyone. I’ll be making this again…often. Thank you for a constant supply of amazingly great recipes! Do you think there’s any way to make it DF? Sub vegan ranch or coconut milk yogurt? And how long do you think it might keep in the fridge, if it lasts that long? ;P TIA! 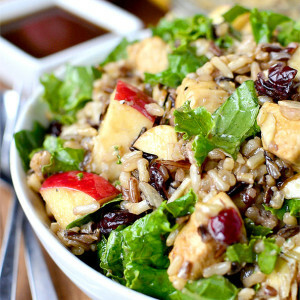 You could definitely use a DF ranch – I love Tessemae’s!